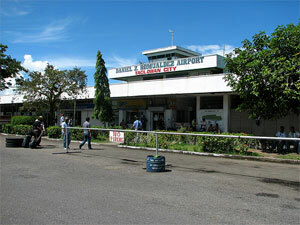 The Daniel Z. Romualdez Airport (airport codes: TAC and RPVA), popularly known as the Tacloban Airport, was built on the Tacloban Peninsula, a really interesting headland to the southeast of downtown Tacloban City in Leyte. The peninsula is practically coterminous with Barangay 88 of the city, and it encloses the Cancabato Bay to the west. Peninsulas like the Tacloban Peninsula are good places to build airport runways since they provide less structural hazards for planes during take-offs and landings. Another runway build on a similar piece of land is the one at Sangley Point Naval Base, built on the Cavite City peninsula. The Air Transportation Office is the government body that operates this airport and has designated it as a major commercial domestic airport. Upgrading the airport to become an international airport would take quite a long time if ever since the runway is still too short and narrow, taxiways are inadequate, and the terminal is not equipped to handle large amounts of passengers. Very likely, an international airport would be built elsewhere, possibly in Ormoc City, instead of in Tacloban. Anyway, the airport was named after Daniel Z. Romualdez, a four-term Leyte congressman who became Speaker of the House during the administration of President Garcia. He’s also the uncle of former First Lady Imelda Romualdez Marcos. The Romualdez clan is probably the most prominent political dynasty in Leyte. I disagree about the Romualdezes as the prominent political dynasty in Leyte. It is the Domingo Veloso offspring that dominates Leyte for decades.The Loreto’s in Baybay, Leyte which is an offspring of Domingo Veloso (1st Congress Speaker Pro-Tempore)is the one dominating Leyte politics until this time. They started in the former 4th and 3rd district but now dominating 1st, 5th and other districts. As a matter of fact, after Marcos district 1 was already dominated by the petilla-loreto clan and in other parts of by cari-loreto clan. Since after WWII the veloso-loreto siblings dominated the Leyte politics. The Romualdezes are only isolated in Tacloban.